It is simple to order a custom portrait. FIRST email me and tell me what you would like. We’ll confirm the price and timing. Then tell me all about your pet, about what you love about them and their personality and little tricks. 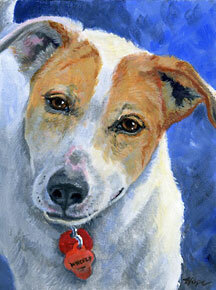 The more I know about your furry friend, the better I can capture them in a pet painting that you will enjoy. I prefer receiving digital files but can work from a good photo print as well. However I cannot be responsible for the return of any photo prints. Digital images should be high resolution (that means 300 dpi) and can either be emailed, or if you are sending multiple large files, can be saved on a dvd and mailed. Please contact me for directions on mailing printed photos and dvds. DEPOSIT: After reviewing your photos, I’ll discuss with you which ones I would like to work from. Then I request a 50% deposit at the beginning. Once received, I’ll get started. When your painting is almost done, I will send you a photo of it for your review via email or for you to look at online prior to shipping for you to approve. APPROVAL: On approval of your pet portrait I will ask for the balance which you can either pay by debit or credit card securely online through Paypal or by check through the post. On receipt and clearing of payment, I will ship your finished pet portrait work. PAYMENT: Payment is made through my secure Paypal account. You may pay with or without having a Paypal account yourself. I will also accept payment by check or cashiers check. SHIPPING: Your painting will be carefully wrapped for shipping. Shipping will be quoted based on the size of the art and the way you would like it shipped. I will only ship by methods that allow the package to be tracked from my studio in Fort Lauderdale, Florida. In the US, I ship USPS Priority mail with a delivery confirmation. You may request optional insurance at an additional charge. The best photos to work from are taken outdoors in natural light on a bright but slightly overcast day, or indoors near a large window. The sun or any light source, should be behind you, and you should avoid having a light source behind your pet. Please avoid using a flash. It tends to create very artificial lighting that can make an ugly painting. However if your very favorite photo of your pet was taken with a flash, send it to me, and let me see if I can work with it. 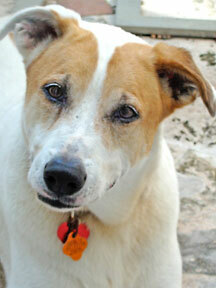 If possible, try to take or select photos that are taken at the same height as your pet instead of above or below them. That means getting down on the floor (or up on the bed) with them–and if you can’t do that, try to pick up your pet and put them on the same level as you. Don’t try this with a big dog though! Try to get as close as you can to your pet, but avoid cutting off their ears or too much of their bodies if it is to be a full body portrait. Photos need to be clear and sharp.